The murderous events at Charlie Hebdo – which raise many questions as to who could have been behind – were timely for the French government – and this for many reasons, national and international. The whole situation and the demonstration of Jan 11th turned into a big manipulation of the sentiments, emotions and fears of the population. Immediately following the events, a demonstration was called for Jan 10th by FrontdeGauche, the Greens and sectors of the Left. Francois Hollande (the French president) reacted to this by organising interviews with all the political currents “to have a national unity movement” the day after, Jan 11th. It would be the silent march, one of political cohesion, without banners or party slogans, and to defend the values of the Republic: “liberty, equality, fraternity”. But the Heads of State who turned up for it in Paris, on that Sunday, many of them killers themselves, had nothing at all to do with those values. In spite of everything, Sunday 11th witnessed an exceptional mobilisation in the whole country. Behind the only slogan, “Je suis Charlie”, the ways of thinking differed a lot. Meanwhile, the media kept feeding ambiguity into much talk of free expression and “Muslim terrorism”. Quite a few people did not want to follow behind the assassin leaders; some did not march at all, or shied away from the Je Suis Charlie placard for political reasons. After a few days, the Left and mainly the alternative media posed the need to place the Charlie Hebdo event in a context of political causes, and the situation as it has led to. The discussions being raised now hark back to colonialism and the Algerian war. They refer to France’s sale of arms to the incriminated ‘radical groups’ – and to the need to leave Nato: wars must be stopped they say, and debates must open on the causes of the wars. Questions are being asked about [the sources of] petrol and raw materials, and the necessity for another economic, social and cultural policy in France. Ideas come up to condemn the neo-liberal ’values’, the lack of democracy, the absence of equality, the republican values lost. People wonder what is going to happen when the “national unity” show finishes. The French government has lost control, and the internal situation is completely rotten. Three Socialist Ministers have already resigned due to political disagreements. The Greens bring their polemics into the National Assembly and join in some of the actions of FrontdeGauche. After Charlie Hebdo, Francois Hollande got only 40% in the opinion polls, his lowest score ever. 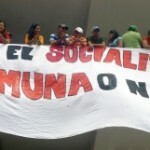 In the recent Municipal elections, half the cities were lost to the Socialists, and things threaten to be catastrophic for them in March, in the Departmental elections. The right and extreme right may well come out winning out of this. The cities crushed by austerity are increasingly fighting amongst themselves. The opposition to the Loi Macron grows. This Law aims at closing more public services and further deregulating the labour market. The population has fought very important battles against it, as in the case of airport sales . A wind of anger is rising from everywhere. In the 2001 “Nine Eleven” events, the United States found the reason to go to war against Afghanistan, and to pass the Patriot Act. By associating the events of Nine Eleven and those of Charlie Hebdo, a similar licence is being given to France to extend its war policies in Africa and the Middle Est. This has now led to searches for “the enemy within” the country, the passing of ultraliberal laws, the imposition of economic measures in favour of big enterprise, the break-up of public services. Democracy has been curtailed by means of immediate judicial interventions against de holding of opinions. A trade union militant was tried for just such an offence. It has become possible in France to forbid to Roma people to bury their baby, and to evict elderly Algerians from their lodgings in the heart of Paris [..]. The Left shows much weakness in all this. The French Communist Party (PCF) defends “the liberty of expression” of their journalist-friends who died at Charlie Hebdo. It is true that the Party holds debates where the option of a social republic is supported. The Party also stands opposed to the war policies of the French government and the imperialist interventions that crush Iraq and Libya, and places in Africa. The PCF gives also some column space to discussions based on another concept of society – but its intervention is quite weak. It does not place the situation in France within the concepts of the class struggle for instance. Roger Martelly does this, but he left the PCF long ago. Comrades like him pose that the present situation is a war of classes and that such a war did not end with the fall of the Soviet Union; they say that the role of the Nazis in Ukraine demonstrates this clearly and that there is no “conflict of civilisations”. It is not going to be possible for the plans of the French bourgeoisie and the Hollande’s government to last long, whatever they are. What comes out clearly from the present situation is that war is already their only solution. What became the Loi Macron was a project of the Social Democrat and Prime Minister M. Valls “to guarantee growth and purchasing power” in France. When Emmanuel Macron, who hails from the banking sector, was nominated to the post of Minister of the economy, this project was declared to be “for growth and activity”. Not entirely legislated upon at the time of writing. The French government has started a process that will sell up to €10 billion in national airport assets. Patriot Act: Passed by the US Congress in 2001 after 9/11: allowing roving surveillance of individuals, more communications intercepts, greater powers for house searches, and more controls over communication services. Although the Jan 11 March in Paris was in the name of “free speech”, 54 persons were arrested three days later for having expressed opinions, and charged with “condoning terrorism”. At the end of 2014, the parents of a two months old Roma baby girl who died in Champlan near Paris were told they could not bury their daughter there. The sites in Champlan, they were told, are “for tax paying” citizens. The Mayor of a neighbouring town fortunately came to the aid of the Roma family. On 30 August 2014, the Deputy for Immigration Chafia Mentalecheta reported that Algerian immigrants who lived for 30 years in a hotel in Paris are being threatened with eviction. The Blog POSADISTS TODAY complements the site of the Posadist IV International. Its aim is to publish and distribute - in the English language - the analyses, positions and activities of the present Posadist movement. The Blog intends to do the same with any document from parties, associations or governments which it deems useful to understand today’s world and unify the revolutionary movements struggling for the world construction of Socialism. 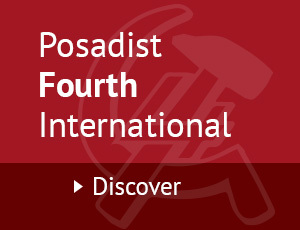 The Site POSADIST IV INTERNATIONAL is essentially dedicated to the integral publication and world distribution of the works of J POSADAS, who died in 1981. It is being progressively enriched by these publications in several languages, as well as by the archives of the national sections of the Posadist IV International. © 2014 Posadist fourth international. All rights reserved.